Did you know that five studies confirm that the daily ingestion of lavender essential oil has enormous benefits? I’ve always known that lavender essential oil was helpful in a diffuser for relaxation and calming. Most likely it was one of the first essential oils I was introduced to when I went to massage school. According to a newsletter put out by The Ananda Apothecary, a series of research studies have positively evaluated the safety and efficacy of 80mg of lavender essential oil ingested daily in a capsule. OK, I have to pause here for a disclaimer and say that with anything you take, make sure you speak with a qualified medical provider first. I share what works for me, and you need to evaluate if it works for you. I make these claims based on my usage of this product. The studies conclude that lavender oil resulted in significantly better sleep and relief from anxiety. In one study, there was a pronounced antidepressant effect and improved mental health and quality of life. Personally, I’m always cautious when using things like this, and I think that is a wise thing to do. So, last night I decided to give this a try. Now, I did not have capsules to put it in which made me improvise. I’m not sure if I did the correct thing, but I put about four drops in a tiny little bit of water and drank it right before I went to bed. The taste was not the greatest, but I took a sip of regular water after that, and I was okay with it. While I was not sure of what to expect, I noticed a couple of things. I slept through the night which has been difficult for me lately. I also felt calmer and peaceful. If you had seen my day yesterday, you would know how much I welcome calmness and peacefulness. According to The Ananda Apothecary, the research found lavender oil to be as effective as prescription sedatives for anxiety and sleep. Also, it does not have the side effects or the potential for addiction. It also was found to be effective for generalized anxiety disorder. Please note that 80mg of oil is about 4 to 5 drops. There is more information on AnandaApothecary.com site regarding lavender oil. A multi-center, double-blind, randomised study of the Lavender oil preparation Silexan in comparison to Lorazepam (Valium) for generalized anxiety disorder. Published in Phytomedicine. 2010 Feb;17(2):94-9. Efficacy and safety of silexan, a new, orally administered lavender oil preparation, in subthreshold anxiety disorder – evidence from clinical trials. Published in Wien Med Wochenschr. 2010 Dec;160(21-22):547-56. 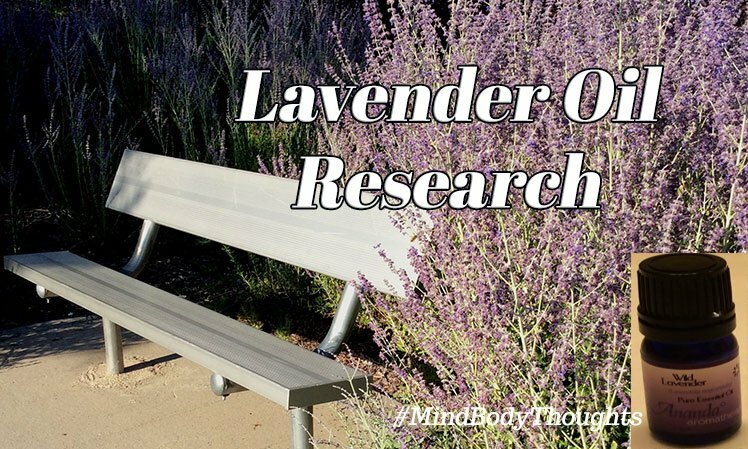 An orally administered Lavandula oil preparation (Silexan) for anxiety disorder and related conditions: an evidence-based review. Published in Int J Psychiatry Clin Pract. 2013 Nov;17 Suppl 1:15-22. Lavender oil preparation Silexan is effective in generalized anxiety disorder–a randomized, double-blind comparison to placebo and paroxetine. Published in International Journal Neuropsychopharmacol. 2014 Jun;17(6):859-69. Efficacy of orally administered Silexan in patients with anxiety-related restlessness and disturbed sleep – A randomized, placebo-controlled trial. Published in European Neuropsychopharmacol. 2015 Aug 7. pii: S0924-977X(15)00242-4. The mechanism of Lavender Oil-Potent Anxiolytic Properties via Modulating Voltage-Dependent Calcium Channels. Published April 29, 2013, in PLOS one.